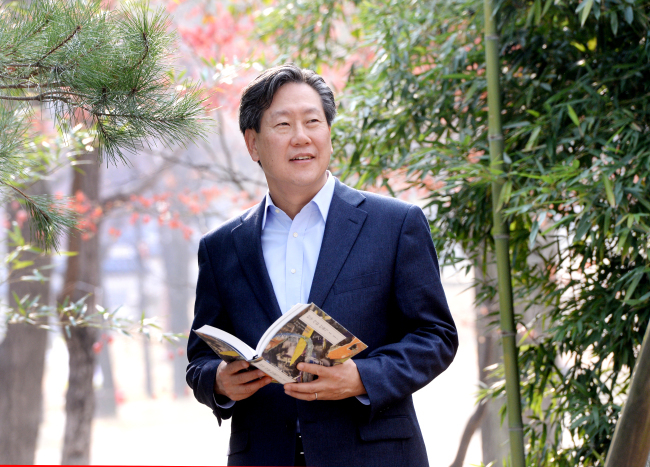 In an age where three-minute book excerpts on mobile phones pass as “reading,” Hahm Chai-bong, president of the Asan Institute for Policy Studies, has boldly set about writing five volumes on the subject of Korean identity. As he elucidates in the preface to “Hanguk Saram Mandeulgi,” or “Becoming Korean,” Hahm’s translation of the book’s title, the multi-volume work stemmed from a personal quest for self-identity. Having spent much of his formative years abroad, he had been nagged by the question of what his identity as a Korean meant since early on. “It came as a shock that people of other countries did not know who Koreans were,” writes Hahm. Learning about Korean history and culture and passing on the knowledge to foreigners would be a way to confirm and strengthen his identity as a Korean, Hahm had thought as a student. “The more professional reason was that as an academic teaching about Korea, political theory or philosophy, or Korean politics at US colleges and Europe, it always fell on me to explain Korea,” said Hahm during a recent interview with The Korea Herald at the Asan Institute for Policy Studies in Seoul. “Because of my major (he holds a doctoral degree in political science from Johns Hopkins University), I tried to delve into East Asian political philosophy in an effort to explain why Korea did this and that, the country’s economic development and democratization,” said Hahm. “What was distinctive about Korea? I tried to answer in various ways. At some point, everything congealed. You can explain it only to a certain extent if you are using a theory. History was the missing component,” he said about the very broad scope of the book. The first volume, which came out in late September from the Asan Academy, is an extensive examination of the Joseon period through the “pro-Chinese isolationist faction” discourse that deals not only with Joseon itself, but with developments in China and Japan as well. The following volumes will discuss “becoming Korean” through four additional discourses: Pro-Japanese Enlightenment faction, pro-American Christian faction, pro-Soviet Communist faction and ethno-nationalist faction. The second volume is due to be released next week and he is currently writing the third volume. Hahm’s ambitious and sweeping quest has great relevance for today’s Korea. “I am trying to explain ‘What is juche ideology of North Korea? Where does this incredible sense of siege mentality come from?’ We see a lot of that in South Korea, too. A lot of anti-foreign sentiment, even though we are very open. There are remnants of nativism, racism which we know are getting stronger as we enter the age of multiculturalism,” he said. He finds historical similarities in “wijeongcheoksa” faction, or a faction that called for national isolation and exclusion of foreigners, that rose to prominence in the mid-19th century Joseon as the kingdom attempted to adjust to the reality of the fall of Ming China and the rise of Qing China. Although the tributary relations continued between the two countries, the literati of Joseon adopted the concept of “Little Sinocentrism,” arguing that Joseon had succeeded Ming China as the true upholder of neo-Confucianism, the state ideology of Joseon. “Are there parallels here? How are what happened in the mid- to late-19th century affecting our way of thinking?” Hahm asked rhetorically. He argues that Joseon’s Confucian identity led Koreans to reject their identity when Joseon fell and that this was when Koreans starting for a new identity. Will he be making any controversial claims in the upcoming volumes? “Pro-Japanese faction discourse will be the most controversial. I will be making a new argument on Korea’s initial engagement with Japan,” he said. “The isolationists are considered the original nationalists while the pro-Japanese faction were extolled for their modernizing effort although they were unsuccessful,” he said. “I start the second volume with the statement that Koreans learned the concept of independence from Japan. From international relations perspective, Japan taught Korea independence because it wanted to breakdown the sino-centric order,” said Hahm. Coming back to Joseon and its lessons for today, Hahm said, “Ideology should not dominate politics,” noting how Joseon scholars and officials had put up a “valiant defense of Confucianism” which ultimately stifled Korean society. “The worst atrocities occur when theories, ideologies, intellectuals dominate,” Hahm warned. Asked if his personal question on identity has been resolved through the writing of the book, Hahm said, “Identity is always on the move. This does not deny the originality and genius of Korean people, however,” he said. “My initial conclusion concerns how these five discourses are manifested in today’s society. Korean history shows that when we open up, we prosper. Yet, we think the best way to preserve identity is to close off,” he said. “Joseon was successful because it adopted a global standard. Toward the end, Joseon chose isolation which cost it its sovereignty. After independence, North Korea chose isolation,” he said. While he wrote the book primarily for himself, he also wrote it for young college students, fellow academics and foreigners, with an English-language edition in mind. “On a personal, national level, I wanted to show how difficult it was being a Korean, especially when I was growing up in the West. I can write this because Korean identity is as solid as it can be. I feel incredible pride at the incredible success of Korea. I feel relief for the young generation who do not have to struggle about it,” he said.